Big biscuits. Buttery. Soft. Tall. Flaky. I close my eyes as I sink my teeth into a biscuit at the Denver Biscuit Company. Supple, creamy textures and buttery flavors remind me of happy mornings in Grandma’s sunny yellow kitchen. My search is over. 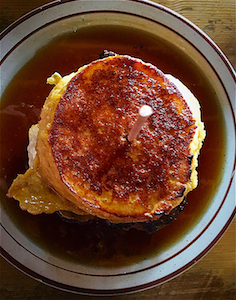 Just a few months after opening on Denver’s famed Colfax Avenue, weekend lines were stretching out the front door with people waiting to counter the previous night’s alcohol indulgences with comforting biscuit bliss. The award-winning menu pairs biscuits with hand-breaded buttermilk fried chicken, spicy house-made sausage, 10-hour smoked pulled pork, local Colorado honey butter, and house-made pickles. Biscuits and gravy? Of course! But don’t stop there. Along with biscuit sandwiches and platters are a chicken and biscuit pot pie and shrimp with poached pancetta and melt-in-your-mouth grits in a biscuit bowl. Or try biscuit French toast and cinnamon rolls. Still hungry? Order the Strawberry Biscuit Shortcake with whipped cream. Don’t forget to wash everything down with a brew from a wide selection of regional choices. The grapefruit IPA makes a delicious contrast to the shrimp and grits. 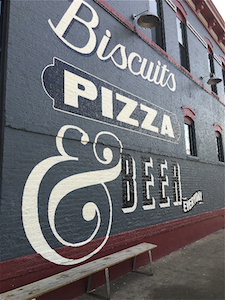 The Denver Biscuit Company shares a space with the Atomic Cowboy Bar and Fat Sully’s Pizza. The industrial/hip environment features exposed brick and stucco with wood beams and floors. A giant neon cowboy checks you out while an eight-foot “rocket” covered in fairy lights is suspended overhead. 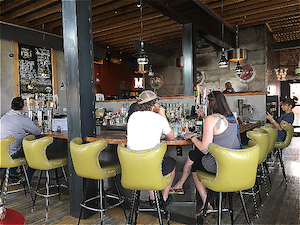 Mounted on a brick wall is a bison head overseeing the deep booths and rust- and avocado-toned bar tables. Wide-screen TVs show Cartoon Network and talk shows along with the requisite sports channels. Shelves in front of a bank of windows are filled with board games above a full self-serve coffee bar. House music is casual, tuned to jazz, blues, and contemporary. Now with three locations and the Denver Biscuit Bus, apparently the search for biscuit perfection has come to a happy ending for a multitude of Denverites.